Born in Murroes, the son of a farmer, Patrick Arklay was a successful linen merchant. His firm, 'Wyman & Arklay' operated from Dundee and Boston. At the height of their trading ventures, a further branch was established in New York. Little is known of Patrick Arklay's earliest forays in business activities. What is certain is that Patrick left these shores, bound for America, aged almost 21 years, when he landed at New York in 1840. The first indication of Patrick's involvement in business occurred between the years 1842-47. Boston City Business Directories list him under the firm of 'Bond (George William), Wyman (Edward) & Arklay (Patrick), Commission Merchants. 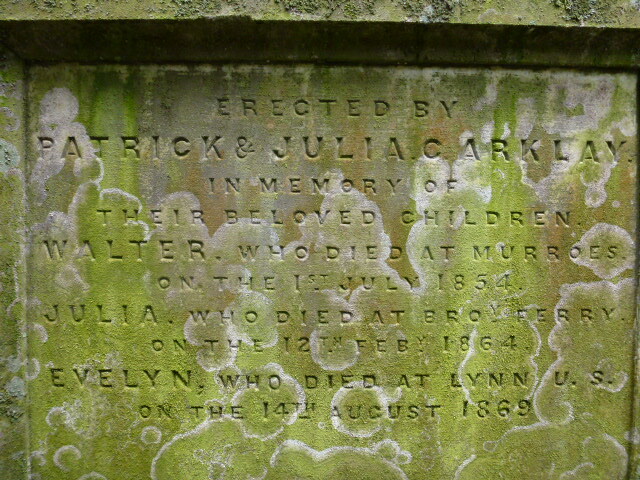 The date of the establishment of 'Wyman & Arklay' is unclear, although it would appear to have taken place by 1848. George W Bond is later listed separately as a broker of merchandise. Patrick's naturalisation papers list Edward Wyman as having known him for at least 5 years (from 1848). The firm of 'Wyman & Arklay' operated a successful company trading in the export from this country of Irish and Scotch linens and also jute fabrics on an extensive scale. Eventually, the firm of 'Wyman & Arklay' enjoyed a very respectable position and made major transactions within the linen trade. Peter Arklay  / known as Patrick Arklay was the son of George Arklay and Janet Smith. His father was a tenant farmer at Murroes. 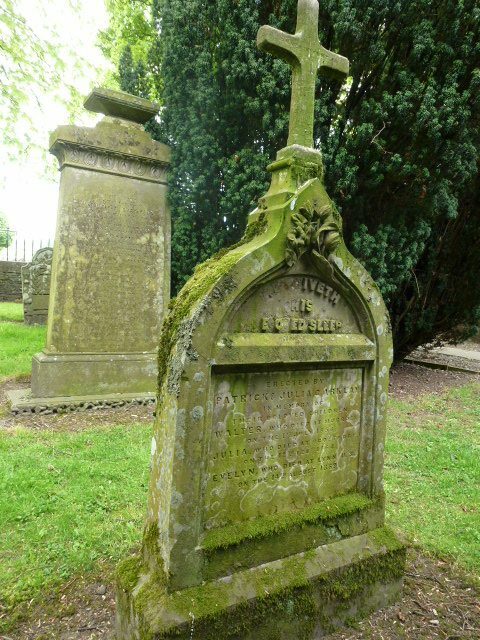 When his father died in 1833, Patrick was merely a lad of 14 years. He also had younger siblings. His father, in his will, had appointed a number of ‘tutors (guardians) and curators’ (to ensure the wellbeing of his younger offspring), including David Arklay at Pitkerro, Peter Arklay of Dunninald (near Montrose) and David Arklay Esq. of Clepington (the latter two being connected with the naming of ‘Arklay Street,’ now subsumed within Dundee). Which influences inspired Patrick Arklay to leave the rural lands of his youth for a life in America is to be wondered at. 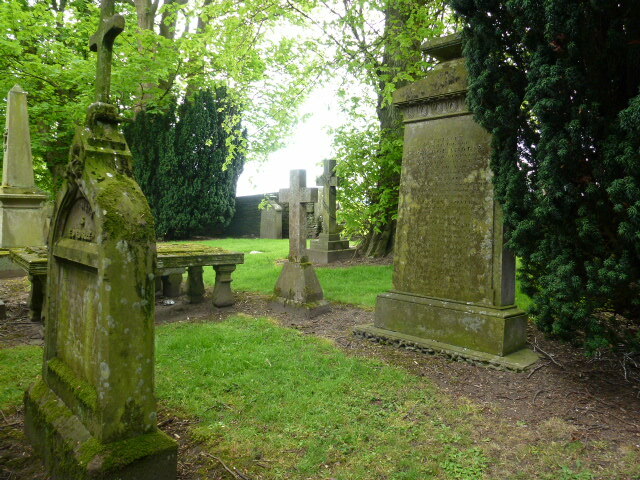 Having arrived in America in 1840, Patrick Arklay was resident in both Boston and Dundee over the following 20 years. This is borne out by various events – Patrick made an initial application for naturalisation in 1845: his marriage took place in Boston in 1849: he is listed in the 1850 census within the household of his father in law at Cohasset, Norfolk, Massachusetts: Patrick became a naturalised American citizen in 1853: the death of his son Walter at Murroes in 1854: the birth of his daughter Evelyn at Craigie House in 1855 (‘father Patrick Arklay Esq., of Boston’): Patrick Arklay’s name appears in the Dundee Postal Directory of 1856-57 listed as a merchant with a home at Craigie House: His following home – Ferry House ‘as presently possessed by Patrick Arklay’ was let furnished in 1862. The lives of his siblings were of a completely different and unconnected nature eg. 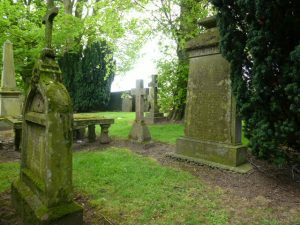 – his oldest brother George became a minister of the Gospel at Inverkeilor: his older brother Alexander a tenant farmer like his father: his sister Betsy married a minister while another sister Catherine married a farmer. Only younger brother David was persuaded into a mercantile life. He too was incorporated in the firm of ‘Wyman & Arklay’ as a partner. 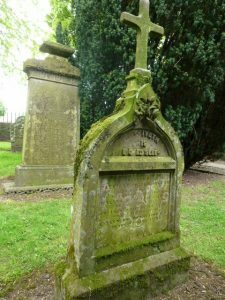 David Arklay, merchant, formerly of the city of Boston, Massachusetts and afterwards of the town of Dundee in Scotland died at Broughty Ferry in 1866, a mere two years after his marriage to Agnes Collier of Balmossie. His marriage to Agnes had provided links with others in the linen trade – his sister in law Robina married the son of William Warden Renny. The marriage also linked him to William Collier and to various members of the Baxter family through his father in law Robert Collier. 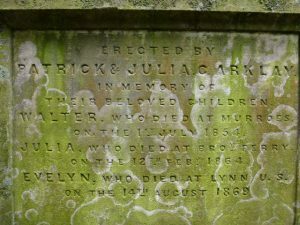 Subsequently, the firm of ‘Wyman & Arklay’ as it then stood, was dissolved by David Arklay’s death. The surviving partners (Edward Wyman, Patrick Arklay and Joel Smith) continued the business, under the same title, from that date until 1868. By the year 1870, Patrick Arklay appeared in the 1870 census for Boston, Massachusetts. He continued at that point to be listed as a linen merchant. The Dundee Postal Directories continued to list ‘Wyman & Arklay,’ merchants, as operating from 2 Royal Exchange Place, Dundee, between the years 1867-72. Who was in charge of the Dundee operation if it wasn’t Patrick himself? ‘Wyman & Arklay’ continued to trade in Boston between the years 1868 and 1872 with Patrick Arklay and Edward Wyman as partners. In 1872 the firm was dissolved. The company re-emerged as a co-partnership, with named partners Edward Wyman, Patrick Arklay, Charles Turnbull and Henry F Ames, who intended to continue the business of the late firm. It is unclear as to the duration of that later incarnation of the company. Although he had left Dundee under a cloud (and a warrant for his apprehension) in 1868, Patrick’s links with his homeland continued throughout his adult life, carving a lucrative existence, over more than 40 years, dealing in Dundee’s staples of linen and jute. The information above about Patrick Arklay has been collated from a range of digital and hard copy sources. To the best of our knowledge it is correct but if you are relying on any information from our website for the purpose of your own research we would advise you to follow up the sources to your own satisfaction. If you are aware of an inaccuracy in our text please do not hesitate to notify us through our Contact page.